A few days ago in Myth, Ritual, and Social Consensus I expounded what I called the myth of the happy family. In that post I made a number of corollary claims that I had planned to develop more fully, but which I did not at that time expand upon. For every myth, there is a true believer out there (or many of them) for whom a given myth is an adequate expression of the world. By the same token, for every myth there is a skeptic (or many of them) who feel shortchanged by a myth that did not and could not be, for them, an adequate expression of life. So it was with the myth of the happy family. Some gloried in it; others despised it. Because a myth reaches only a part of a mass population on a visceral level, for the myth to have social efficacy it must be policed by social and state institutions. The myth of the happy family could only be perpetuated by the brutal suppression of any non-conforming element that defied the myth or failed to fulfill the rituals by which the myth was reenacted in the daily lives of the members of industrialized society. For example, the myth of the happy family essentially excluded social mobility. Intimacy between rulers and the ruled in traditional societies has been a casualty of mass society. Today rulers and ruled communicate through mass media outlets such as television, radio, newspapers, magazines, and the internet. However skilled contemporary politicians become in the exploitation of mass media, it is still mass media and it is not a personal, face to face encounter — not even from a distance. The exponential increases in population that accompany the early stages if industrialization and urbanization (the result of improved nutrition and improved medical care) create mass society, and mass society can only be reached through the mass media. Even if a politician today preferred to meet constituents face to face, it is physically impossible for any one individual to meet millions of people; any politician who disdained the mass media would be defeated, so that the use the mass media is strongly selective. However, once mass media becomes the primary tool of political communication, it changes the nature of communication. Mass communication is de-personalized. Another word for “depersonalization” is “dehumanization.” We have all felt this, that the bureaucratic organization of mass society is depersonalizing and dehumanizing, even if we hesitate to admit to ourselves the full implications of this feeling. A small, traditional society is dominated by personal relationships and interactions on a human scale. As we have seen, this is impossible in industrialized societies. In anonymity of mass society, social sanctions and social rewards that functioned efficiently in small, traditional societies function inefficiently or not at all. It would be extraordinarily difficult, in the midst of a large conurbation to, for example, enforce “shunning,” since a shunned individual or family could simply move to another neighborhood within the same large city. It is not at all unusual in our time for individuals to “re-invent” themselves by suddenly finding new friends, going to different places and participating in different events than those that has previously given structure to their lives. This kind of personal reinvention was impossible in the past for those who remained within their community. In traditional societies, mythologies were coextensive with the closed social group that constituted the society. If anyone was alienated by the mythology that permeated a traditional society, they would have to leave because they could not avoid it. This is no longer true. Today, a particular mythology may be dominant, but the minorities that do not share the mythology are significant. In the early modern period, several nascent nation-states sought to purge their countries of non-conforming elements, as when France sought to expel or convert the Huguenots and Spain sought to expel or convert the Jews. For ideologically-motivated monarchs who sat at the head of the dominant mythology, there was a strong desire to “clean house,” but this strategy turned out to be economically ruinous. The practice has not entirely disappeared, as the Nazis tried to exterminate the Jews and recently several exercises in “ethnic cleansing” have sought to purge the body politics of elements deemed undesirable, but in democratic capitalism such efforts are difficult to carry out and counter-productive. As a result of these trends, the dominant myth of a given mass society is probably only felt on a visceral level by a core minority in positions of privilege and status. This dominant minority that lives the myth might prefer that everyone shared their personal commitment to the mythology they understand to be central to their society, but such mythological conformity can no longer be enforced in fact, and an attempt to enforce it would be so socially disruptive that it would threaten the social cohesion of the society and therefore the myth itself. As for the second item, that social mobility is largely excluded by the myth of the happy family, I suppose that some readers might find this an odd claim for me to make, since the myth of the happy family is so closely associated in the minds of many with the “American Dream,” and for many, again, the American Dream is nothing but social mobility: the you will eventually live better than when you started out, and that your children will live better than you, possibly joining the professional class and moving up in society not merely in terms of income and comfort, but also in terms of social status. There are as many versions of the American Dream as there are hopeful Americans (and would-be Americans) dreaming for a better tomorrow for themselves and for their children. But in so far as the strong form of the myth of the happy family persists (and it is arguable that it no longer persists in its strong form at all today, even though it does persist in several weaker permutations), it excludes from under its “sacred canopy” anyone whose social status advances to the point that the rituals of domesticity by which individuals participate in the myth become impracticable or impossible. If you are always away rushing to meetings or flying to conferences, you can’t be at home to participate in daily family rituals. If you’re too busy to attend to domestic responsibilities yourself, and you hire help to clean or mow the lawn or to take care of your children, with each domestic responsibility relinquished there goes along with it one domestic ritual, and one less opportunity to participate in the myth of the happy family. At least one of the drivers of social change in our time, which includes the process I have attempted to describe of seeking a new social consensus for the organization of industrial society, is the fact that the dominant minority who truly believe in and viscerally have felt the myth of the happy family are those who have been most successful and therefore most forced by circumstances to abandon the rituals of the happy family in order to attend to their duties to larger social wholes. Such individuals, trapped by their own feelings and beliefs, produce rationalizations and justifications for being absent from the formative events in their childrens’ lives, but precisely because they are true believers in the myth they know in their hearts that these rationalizations and justifications are just that — rationalizations and justifications. In an early post to this forum, Social Consensus in Industrialized Society, I suggested that, since the advent of the industrial revolution, industrialized societies have passed through two stages of social consensus in the social organization of industrialized society. At present I consider industrialized societies to be in search of a third social consensus for the structure of an industrialized society. I have returned to this theme on several occasions, and wrote about the mythological dimension of industrialized societies in The Role of Ritual in Industrialized Society and Ritual and Myth in Modernity. The first stage of social consensus under industrialization was the “factory system” that closely resembled the social organization of agricultural society, of which early industrial society was the immediate successor. The second social consensus of industrialization was the sanitized image of mid-twentieth century normalcy of neighborhoods, schools, churches, and hospitals. An important difference between these two previous forms of social organization is that the first was a mere accident of history — a displacement of the organization of agricultural production into industrial production — while the second was based on a modern myth. A social consensus with a mythology attached to it is something far more powerful that a social consensus that comes about as a result of the accidents of history — i.e., a form of social organization that a society blunders into as a result of doing the best it can at each stage of development. When a myth is attached to a social consensus, that social consensus becomes a model to which people aspire to live up to. What was the myth of the second industrialized social consensus? For convenience I will call it The Myth of the Happy Family, although the mythology is much larger than happiness or families narrowly construed. Tolstoy famously said that all happy families are alike, but each unhappy family is unhappy in its own way. This imperative of likeness makes the myth of the happy family a mythology of conformism and rigid social roles. It is to be noted that this was not a religious mythology, but a domestic mythology. 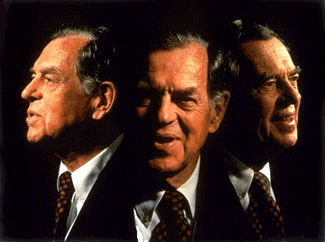 I have many times quoted Joseph Campbell to the effect that a ritual is an opportunity to participate in a myth. The rituals by which one participated in the myth of the happy family were the rituals of domesticity: father coming home from work, hanging his hat up, saying, “Honey, I’m home!” as he closes the door, with his wife standing there with a martini already prepared and handing it to him while two beaming children stand in the background, ready to hug their father after he has kissed his wife. The ritualized family evening meal follows next. While the living and working conditions of the working class during the early industrial revolution under the “factory system” were appalling, and are remembered as such — there is no nostalgia for these conditions — the myth of the happy family continues to have its adherents. It retains a seductive quality precisely because of the power of its strong social roles and unambiguous expectations for individuals. People who feel discomfited by the complexities and shifting expectations of the contemporary world look back to the myth of the happy family as a model still to be instantiated by industrialized society. This mythology still today influences how we live our lives — not only because of nostalgia, but for concrete, economic reasons. In fact, the myth of the happy family influences our architecture, as I tried to show in Industrialized Space and Time. Recent attempts at architectural traditionalism incorporating front porches and driveways and garages confined to alleyways are intended to reproduce a neighborly community where families sit on their front porch sipping lemonade and chatting with their neighbors who stroll by, all without being interrupted by vehicular traffic. It sounds silly to talk about it in this explicit way, but given the price of housing in industrialized countries there is serious money at stake in this quaint vision. It is possible that contemporary developments are pushing us toward of social consensus that might be called The Myth of the Happy Individual. I don’t think that this myth has fully taken form yet, and I am not predicting that it will fully take form, but there are signs of it throughout contemporary society. There is an implicit paradigm of the well-lived life today as consisting of a highly diverse collection of personal experiences, as exemplified in a “bucket list” of things that an individual would like to experience before “kicking the bucket.” This is the vulgar version, but you may also recognize the happy individual as the fully self-actualized individual perched on the top of Maslow’s hierarchy of needs. Both myths — the myth of the happy family and the myth of the happy individual — are equally pernicious. Both engender far more unhappiness than happiness precisely because they attempt to enforce happiness as a norm. If your family isn’t happy, then there is something wrong with it and you’d better get it fixed. If you’re not happy, there is obviously something wrong with you and you probably should be in therapy. Life is hard enough as it is; to add the extra burden of the expectation of happiness makes it unbearable more often than not. A few weeks ago in Take Comfort in Rituals I offered a commentary on the then-current Starbucks slogan that had been emblazoned across their many locations. This “ritual” campaign did not last long, as I noticed that the slogans disappeared not long after I wrote about them. 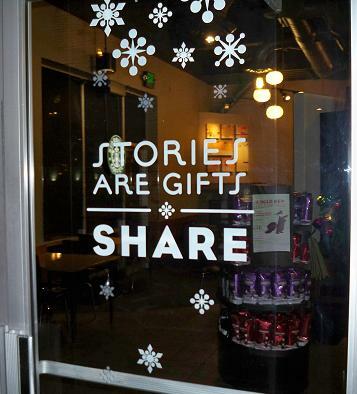 Now a new series of slogans have appeared at Starbucks, and it looks like the marketing team has made the transition from mythology to narrative, as they have gone from promoting rituals to promoting stories. In so far as a myth (embodied in a ritual) is a special case, a particular example, of a narrative, the passage from mythology to narrative represents a passage to a greater level of generality, and therefore possibly also a connection to the perennial, universal truths of the human condition. And what could a marketer desire more than to establish some connection between a brand and the universal truths of the human condition? In The Totemic Paradigm I discussed the significant and growing role of narrative theory in many aspects of contemporary thought, from analytical philosophy of mind to psychotherapy. It would not surprise me in the least if someone on the Starbucks marketing team has tapped into this vein of thought, and in so far as popular culture learns from serious scholarship, we are the better for it. George Lucas struggled with his screenplay for the original Star Wars film until he happened upon Joseph Campbell’s The Hero of a Thousand Faces, which provided a template for the schematic science fiction hero story that he then went on to write. While it may seem cynical or crass for the Starbucks marketing team to expropriate narrative theory for selling coffee — or, rather, selling the experience of drinking coffee — if our experience of coffee can be reconfigured and recast as more of a cultural experience and less of a consumer experience, we are probably the better off for it. Like a great many other people, I stopped at a Starbucks close to my office for my near-daily hot chocolate and saw their new marketing slogan emblazoned on the door: “Take comfort in rituals.” When I got back to my office I Googled the slogan and found that a great many bloggers have already entered the fray on the slogan. It would be easy to dismiss this in an entirely cynical way, but I think it bears serious consideration. 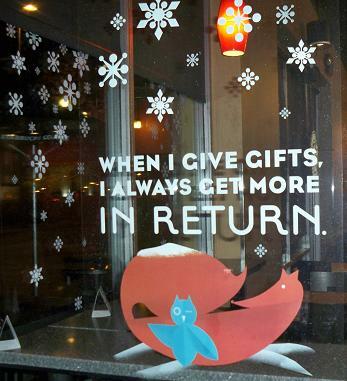 It may be a mere marketing slogan, but it also points to deeper things. 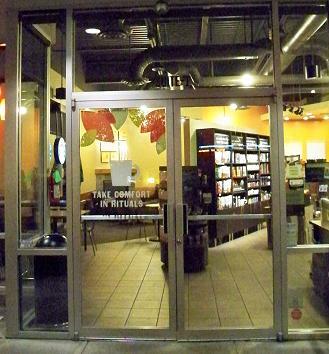 So if a ritual is an opportunity to participate in a myth, as Joseph Campbell holds, and visiting your local Starbucks is a ritual, as the Starbucks marketing team holds, in what myth are we participating by visiting a Starbucks? This is a good question, and in a sense it goes to the heart of many posts I’ve written about the role of mythology in industrialized society. You see, today we mostly lack explicit myths, though we still engage in rituals. These are rituals in search of a myth. Another point to which Joseph Campbell returned repeatedly, citing a passage from Jung’s autobiography, was how Jung came to a point in his life when we asked himself, “By what myth am I living?” and he realized that he didn’t know. Once he had asked the question and had realized that he didn’t know by what myth he was living, he knew that he had to discover the myth by which he was living. The discovery of the myth by which he was living became a quest. Joseph John Campbell (26 March 1904 – 30 October 1987) said that “A ritual is an opportunity to participate in a myth.” So does that mean that we are “living mythologically” by going to Starbucks? 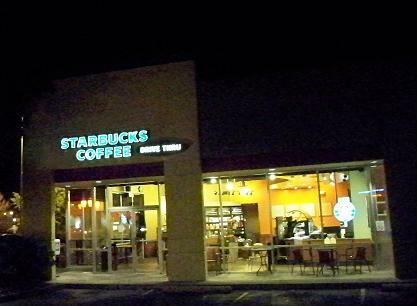 While many of us might not like the idea of a daily stop at Starbucks being a ritual, it certainly does have ritualistic aspects. 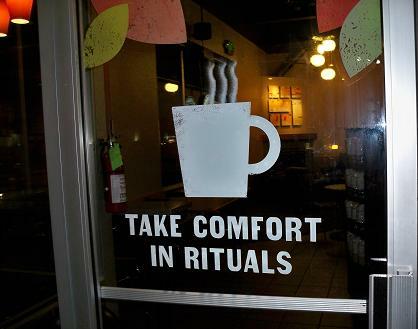 And the marketing team at Starbucks is right: people do in fact take comfort in their rituals. 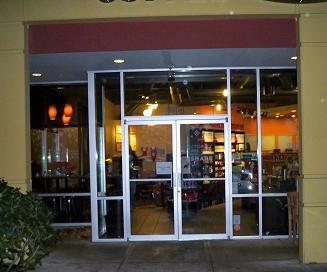 So in the midst of a hectic day at work, a typical customer might stop at a familiar Starbucks and order a familiar drink and consume that drink in the midst of familiar surroundings. I can easily imagine that this ritual of coffee drinking is felt to be something of a respite in a day filled with schedules and meetings and demands. We find rituals comforting. Why? At least one reason is their familiarity. Most of the surprises that the world has in store for us are unpleasant surprises. Watch the local news in your city and you will encounter a list of crimes, fires, and broken water mains. These are unpleasant surprises. Pleasant surprises are rare. 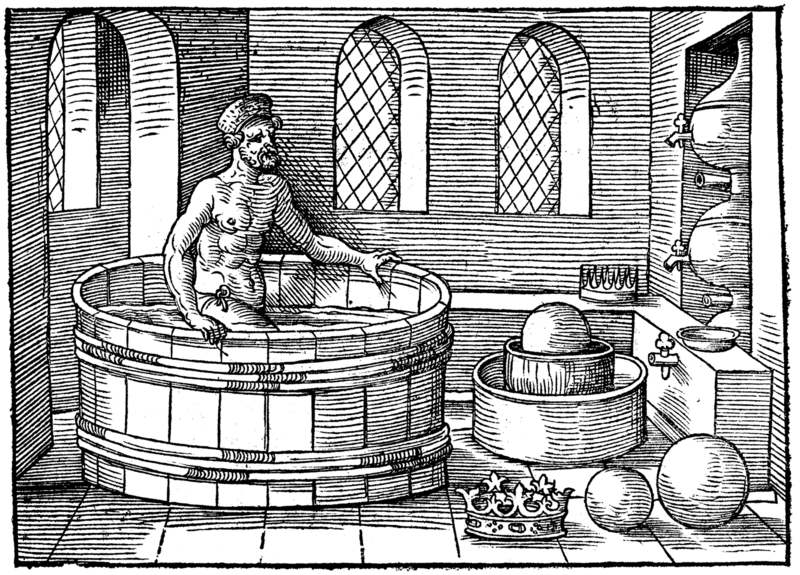 To engage in a ritual is to settle in to a familiar algorithm of life in which each step follows the preceding step with gratifying predictability. While this may unfortunately eliminate a few pleasant surprises, it also eliminates (or minimizes) a far greater number of unpleasant surprises. Perhaps one of the sources of our comfort with familiarity is the conditioning of our lives by settled civilization. I have observed that settled civilization begets settled forms of thought, and there is no more settled form of thought than that prescribed by a ritual. Not only can our actions follow a familiar course of predictable steps, but our thoughts too can be ritualized, falling into a comfortable rhythm of a familiar sequence of ideas in which the equilibrium of one’s mind is not disturbed. Ritualistic thought is perhaps a kind of meditation. Rituals, then, may comfort us because they are familiar and they help to keep us calm and peaceful in the midst of a chaotic and unpredictable world. This is perhaps a place to start, but it is only a start. We have not even attempted to answer the question above in regard to, “in what myth are we participating by visiting a Starbucks?” I do not yet have even a suggestion in answer to this question, though I suspect that interesting ideas would emerge from pursuing this question more systematically. In fact, I will need to think more about this. 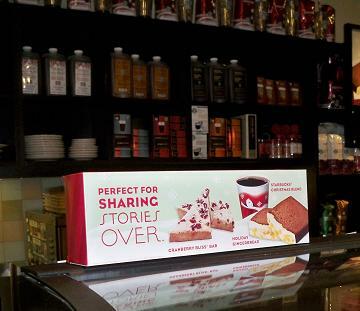 I’ve considered a follow-up Starbuck’s slogan in From Rituals to Stories. 1. Distinctions must be made among myth, ritual, and celebration. 1.1 Myth, ritual, and celebration, though distinct, are logically related. Therefore a celebration is an occasion in which to participate in a myth. 1.2 Rituals of burial are older than agricultural rituals of life-death-rebirth, even extending to other species (Neanderthals, now extinct), and may well be the origin of life-death-rebirth rituals. 2. Among the most ancient of continually observed celebrations is that of the life-death-resurrection of the Year-God, eniautos daimon. 2.1 The celebration of the life and re-birth of the Year-God, eniautos daimon, is at least as old as settled, agrarian society. 2.11 Agriculture and the written word together produced settled, historical civilization. 2.12 Settled historical civilization has defined the norm of human history from the Neolithic Agricultural Revolution to the Industrial Revolution. 2.2 Settled agrarian society coincides with the origins of civilization. 2.21 The celebration of the life and re-birth of the Year-God, eniautos daimon, coincides with the origins of civilization. 3. Once the breakthrough to history has been made by way of the written word, it is the nature of historical civilization to commemorate nodal points of the year, whether with solemnities, festivities, or both. 3.1 Historical civilization is predicated upon the presumed value of the history that brings that civilization into being. 3.2 Nodal points of the year celebrated in historical civilizations are observed as validation of their historicity through the performance of rituals. 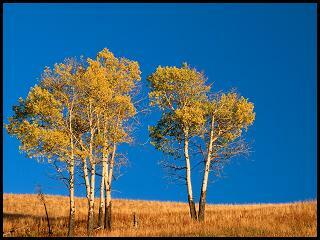 3.21 In a temperate climate, summer and winter solstices and spring and fall equinoxes are nodal points of the year. 4. The mythology of a settled, agricultural civilization emerges from the same regularities of nature observed of necessity by agricultural peoples. 4.1 The calendrics of celebration emerges from the regularities of nature observed of necessity by agricultural peoples. 4.11 The mythology and calendar of celebrations of settled, agricultural civilizations come from the same source. 4.2 Celebrations are the points of contact between the two parallel orders of mythological events and the actual historical calendar. 4.21 A civilization validates its mythology by establishing a correspondence between mythological events and historical events. 4.3 Enacting a myth in historical time, by way of a ritual, makes that myth literal truth by giving to it a concrete embodiment. 5. Easter is one species of the genus of life-death-rebirth celebrations. 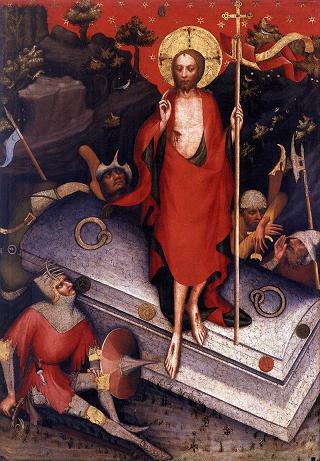 5.1 The particular features of the Easter celebration are the result of the adaptive radiation of the dialectic of sacrifice and resurrection. 6. Easter is that species of life-death-rebirth celebration specific to Christendom. 6.1 Christendom was primarily a construction of the Middle Ages. 6.11 Christendom was the legacy of Medieval Europe that disappeared with the passing of medieval civilization but which, like the Roman Empire before it, is with us still and remains a touchstone of the Western tradition. 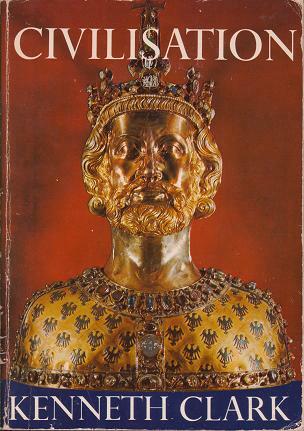 6.12 Christendom was an empire of the spirit and of the cross as Rome was an empire of the will and of the sword. 6.13 To have once been Roman, and then to have been Christian, and finally to have become modern, is the condition of Western man. 6.2 Easter is a celebration specific to civilization, the civilized celebration par excellence. 7. The naturalistic civilization that is emerging from the consequences of the Industrial Revolution represents the first significant change in the social structure of human society since the Neolithic Agricultural Revolution. 7.1 With the advent of the Industrial Revolution, we have ceased to be an agrarian society. 7.2 For the first time in history, life-death-rebirth celebrations face interpretation by a non-agrarian society. 7.21 Not only should we not hesitate to find new meanings in ancient celebrations, of which Easter represents the latest adaptive radiation, but rather we should actively and consciously seek meanings relevant to the present in such celebrations. 8. As the painters of the renaissance drew upon the traditions of pagan antiquity already at that time a thousand years out of date, so too the post-Christian Western civilization will draw upon the traditions of Christendom for hundreds if not thousands of years to come. 8.1 The period of time that we have come to call the modern era — roughly the past five hundred years — has not been the modern era proper but rather has been the period of the formation of modernity. 8.2 Modernity simpliciter has but begun. What we notice immediately about this is that it is a formulation that any naturalist can enthusiastically endorse. There is nothing otherworldly here, nothing supernatural or superstitious. Anyone, without any shred of belief in another world or without assenting to any theological proposition, can feel a sense of wonder and awe before the absolute mystery of being. Plato said that philosophy begins in wonder. I feel this myself, and I think that contemporary science encourages people to feel this wonder even as it seeks to understand the mystery. Indeed, Campbell in these lectures mentions in passing (mentions so quickly that I am sure many do not hear it, and many probably don’t hear it because they don’t want to hear it) that he prefers naturalistic formulations. For Clark, religion at its best can serve a civilizing function that refines and elevates the emotional and communal life of man; religion here is a source of edification. Man is improved as man by cultivating what is best within the religious instincts. 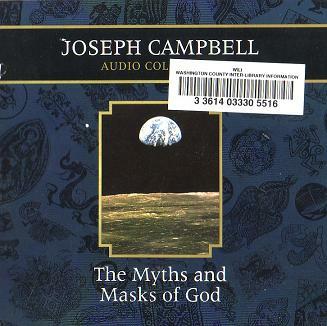 Clark’s naturalistic conception of religion in terms of spiritualized emotion is a more implicit formulation while Campbell’s formulation is a more-or-less explicit definition, but the similar intention to place religion within the life of man, and especially of man within society, is clear. There is an entire philosophy of theology implicit in this humorous passage from Campbell, and it would be worthwhile at some time to draw out the implications of this, but for now let us move on. Here Clark clearly interprets northern man around 1500, primed for the Protestant Reformation, as an idealist. (I have been to the same museum and seen the Riemenschneider sculptures there, and I find Clark’s description of them better than anything I could have come up with on my own.) It would not be too much to say that Clark’s interpretation is itself idealist. The very idea that “forms and ceremonies” were something with which unserious men might be “fobbed off” but which serious men would never accept is diametrically opposed to the point of view presented by Joseph Campbell. Previously, in Civilizations of the Image and of the Word, I mentioned Clark’s tendency to see the world from a Protestant point of view. This is another example of that. But it is also an example of the conception of social consensus based upon ideal aspirations. A few days ago in The Two Sources of Social Consensus I quoted my Variations on the Theme of Life to emphasize the difference between those who view the ideological superstructure of society as a necessary façade, a falsehood that must be propagated for the good of society — a distinguished group amongst which Plato must be counted, for he formulated near the beginning of Western history the idea of a “noble lie” with which the common people would be controlled by elite Guardians — and those who are committed to the idea that the ideological superstructure of society authentically reflect the ideals and aspirations of the people, and who are intolerant of human failings, foibles, and lapses. While this is a schematic simplification, we could call these two perspectives, here represented by Campbell and Clark, the pragmatic conception and the idealistic conception of society. Both formulations are naturalistic in a thorough-going sense, but the shared naturalism of Campbell and Clark does not lead them to the same interpretation of religious experience. Even two naturalistic formulations of religions can profoundly differ. From this one might conclude that the difference is not necessarily in the religion or its ideas or its practice, but in something that transcends religion, something founded much more fundamentally in the world and in the human psyche. The different temperaments of Campbell and Clark express themselves in different naturalistic interpretations of the role of religion within human society. These temperamental distinctions are deeper than the social expressions of temperament, and that is why these diverse temperaments manifest themselves in different forms, although repeatedly, throughout history. Campbell is an iconodule; Clark is an iconoclast — respectively, a naturalistic iconodule and a naturalistic iconoclast. Campbell is Catholic; Clark is Protestant — again, respectively, a naturalistic Catholic and a naturalistic Protestant. It is to be expected that these differences, and the dialectic between the two that emerges, will continue to be iterated throughout the future history of our civilization. The pattern is older and deeper than that which exhibits the pattern in its development.